Also serving communities of Elmo. To help you with your search, browse the 8 reviews below for assisted living facilities in Price. On average, consumers rate assisted living in Price 3.0 out of 5 stars. Caring.com has helped thousands of families find high-quality senior care. To speak with one of our Family Advisors about assisted living options and costs in Price, call (855) 863-8283. Price, Utah has many attractions for people of all ages such as the Cleveland-Lloyd Dinosaur Quarry, The Museum of the San Rafael and The Prehistoric Museum. After learning about history, seniors living in Price can head home and relax at one of Price's two assisted living facilities. The Health Facility Licensing, Certification and Resident Assessment governs facilities in Price, as well as others in the state, on behalf of the Utah Department of Health. This bureau performs routine inspections to ensure assisted living facilities treat residents appropriately. Seniors in Price pay less for many necessities than residents of other Utah cities. Price has a 92.2 cost of living score, which is lower than the U.S. average of 100 and the Utah average of 104. The Price area is home to world-class medical facilities, including Castleview Hospital, in the event of medical emergencies or illness. Elderly residents simplify tax time by visiting volunteers for help filing returns. Retired Price residents may qualify for as much as $450 back in the form of a tax credit only available to filers age 65 and older; younger residents only qualify for up to $288 per person. Income affects the credit amount, and seniors lose 2.5 cents from the $450 tax break for every dollar that exceeds $25,000. Despite the potential tax break, seniors should keep in mind Utah is one of the only states that taxes Social Security income, and retirement funds also accrue taxable benefits. Seniors in Price should watch their surroundings closely, as the city is only safer than 8 percent of U.S. cities. There is a one in 23 chance of falling victim to a property crime, which includes home burglary, property damage and automobile damage or theft. There is a one in 761 chance of becoming a victim of violence in Price. Temperatures typically fluctuate from the high teens to the high 80s throughout the year in Price, Utah. Summers are warm, and winters are chilly. There is snow in the winter and rain throughout the year. Elderly residents can breathe comfortably in Price, Utah. The city has an air quality score of 84, which is 26 points higher than the U.S. average. This score is also higher than many other parts of Utah, including Logan and Salt Lake City, which have a spot on the American Lung Association's list of the most polluted cities. Assisted Living costs in Price start around $0 per month on average, while the nationwide average cost of assisted living is $4,000 per month, according to the latest figures from Genworth’s Cost of Care Survey. It’s important to note that assisted living rates in Price and the surrounding suburbs can vary widely based on factors such as location, the level of care needed, apartment size and the types of amenities offered at each community. 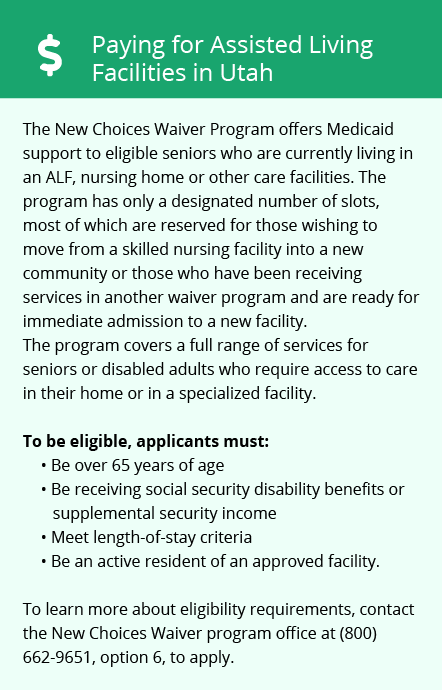 Cedar Hills seniors who currently live in a nursing home or assisted living facility can request financial help via the New Choices Waiver. Seniors who have a demonstrated need for assisted living services but do not yet receive them can apply through the Aging Waiver for Individuals Age 65 or Older. Price and the surrounding area are home to numerous government agencies and non-profit organizations offering help for seniors searching for or currently residing in an assisted living community. These organizations can also provide assistance in a number of other eldercare services such as geriatric care management, elder law advice, estate planning, finding home care and health and wellness programs. To see a list of free assisted living resources in Price, please visit our Assisted Living in Utah page. 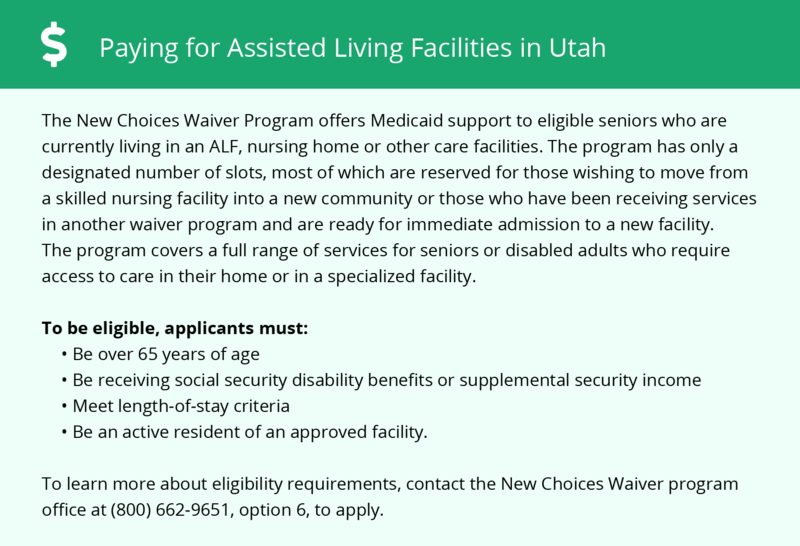 Price-area assisted living communities must adhere to the comprehensive set of state laws and regulations that all assisted living communities in Utah are required to follow. Visit our Assisted Living in Utah page for more information about these laws.